Togari Onsen Japanse powder ski resort and Temple guest house. The skiing and snow has been fantastic and our stay at Kogenso even better ! The dinner is so amazing and tasty every night and Tota and the whole family are very welcoming and friendly. Our stay has been just perfect and relaxing. My fiancé and I spent four nights here after our stay in Nozawa Onsen and it was by far the most authentic experience we had in our month in Japan. 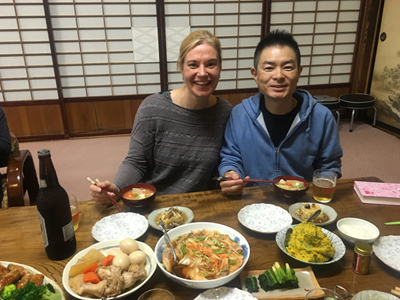 This family run guest house and temple was the highlight of our trip and the food was not only some of the best we had in Japan, but also some of the best we have had ever ! Along with the food the hospitality was above and beyond, Tota and Mi organized everything from our lift passes to ski hire and ski lessons to transport and even took us to go and see the famous hot spring snow monkeys ! Kogenso temple guest house is an experience we would recommend to everyone the temple itself has a history of around 600 years and is one of the many things that make this place a unique and amazing experience. 10/10. Oh did I mention that the temple stay is ski-in-ski-out ? Check out this amazing gem while it's still off the beaten track because before too long it will be flooded with tourists ! 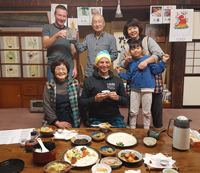 We have been visiting Kogenso for many years and can warmly recommend it as a great place to relax, experience some traditional Japan and mix with the locals: the family running guest house (the monk and his wife, together with their son, also a monk, his wife and their four small children) are one of the friendliest people we have ever met! They will really make you feel at home! The location is perfect, Iiyama is a quiet little town with a few nice Onsen, lots of temples and close enough to visit other interesting places such as Nozawa Onsen, Obuse, Shibu Onsen and the snow monkeys, etc. It is located in a hill next to ski center with nice view down to the village. The place and the people made me relaxed and after night full of fresh air and nature sounds. I also learned some new things about Buddhism, could attend morning pray and ate every day delicious food made in temple. Near the temple is onsen (Japanese hot spring, public bath) for the people. It is basic one with one inside and one outside pool. Rooms are simple and guests sleep on futon. In the mornings we got delicious and filling breakfast and in the evenings delicious and even more filling dinner. key words : Japow, ski Nagano, guest house, lodge, Iiyama, Nozawa Onsen, Zen experience, family ski, hot springs. easy access by train.